This was my second visit to San Francisco but the first time as an adult so it was time to party! I got a great deal through Expedia and stayed at the Hyatt Regency in downtown. The room and service were excellent – just what I needed at the end of a long trip. Now onto the stuff. It’s always about the stuff! Oh I’m going to be completely touristy here. Well why not start with one of the most well known prisons in the world. 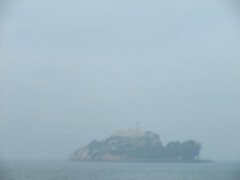 Predictably the ferry trip over was surrounded by fog thus helping to create the ideal atmosphere. You can opt for an audio guide or not but obviously it’s better with one (and comes with the ticket anyway). 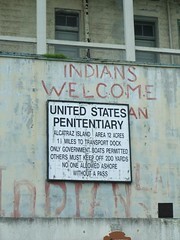 I was somewhat familiar with the prison but didn’t know that it was also a military fort, a Native American sit-in protest site and lastly a nature reserve. Many of the buildings are in a state of neglect (probably managed by the Parks Service to keep it at the same level from when they took it over). I rather liked the tour. It was a little tiring walking around but the various anecdotes (such as prisoner escape attempts) made me forget all about sore legs! Or perhaps it was the refreshing sea air. I went early and would suggest the same as it helps to bypass more tourists and maximises the amount of time you can spend on other sightseeing. 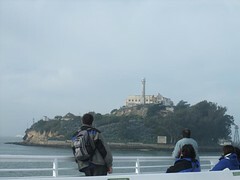 It may be a bit cliché to go and visit Alcatraz but it is worth the trip. 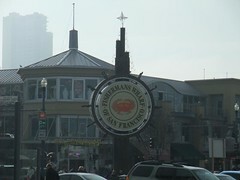 Along the bay is the tourist destination of Fisherman’s wharf and Pier 39. There are an abundance of shops catering to tourists, it’s a bit of a trap but enjoyable to wander around in. 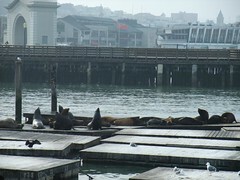 Also at Pier 39 you can also check out the seals. 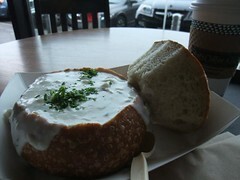 Throughout the Wharf, Piers and San Francisco you’ll come across stores selling clam chowder in sour dough bowls. I finally tried it at Boudin’s Bakery (which also has a tour but I didn’t go on it). I thought the dough was a bit, well, sour but on the whole rather nice and filling. 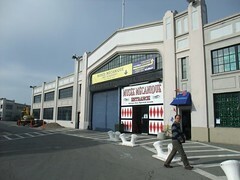 Lastly, you might be interested in checking out Musée Mécanique which houses a number of historic penny arcade machines. Most, if not, are still useable and looks like it could be a lot of fun (and just a touch geeky) to play around with. 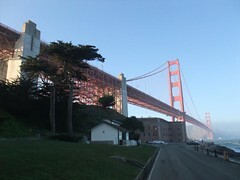 After a bit of a mammoth walk around San Francisco I walked towards the southern end of the Golden Gate Bridge. Don’t worry there are public transport options I just felt like walking. 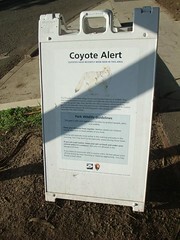 Before I got there I walked briefly through the presidio where there was a warning about the potentials for coyotes! 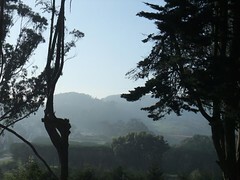 Even so the presidio was surprisingly calming and relaxing. 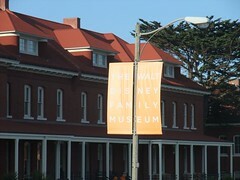 There’s also the chance to visit the Walt Disney Family Museum but I didn’t have time to go in and check it out. Not to mention the $20 entry fee seemed a little steep. 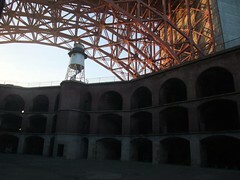 At the base of the bridge you’ll find Fort Point. It’s free to enter and a very informative museum covering the history of the fort and military, the bridge and some of the city’s history as well. Top it all off with some excellent views from the roof of the fort and it was definitely one of my favourite places. Castro District – Otherwise known as a the LGBT heart of the city. Having heard so much about it for years I expected something particularly wild but it felt like it was a bit gentrified. A rather relaxing and easy going spot. In many ways it was the same sort of vibe as Sydney’s Oxford Street and London’s Compton Street. 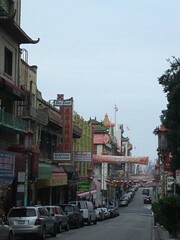 Chinatown – Some Chinatowns can be smaller than you expect (London) and others exceed expectations. 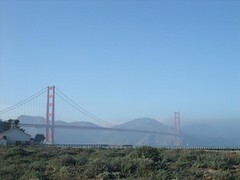 San Francisco falls under the latter, with numerous shops and cultural establishments down and around a long avenue. The Haight – I think I completely missed this iconic district after getting slightly turned around at Alamo Square. It’s apparently worthwhile but I don’t know. I’m not a hippy/ flower power kind of guy. Still it’d be another reason to come back to the city. Cable Car – I’m not entirely sure if I’d even found the correct spot. I was basing my search on an online mapping reference without having double checked the website. Lesson learnt. 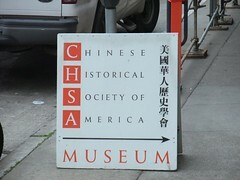 Chinese Historical Society – Prominent signage exists throughout Chinatown and the surrounds. I was quite interested in checking it out but when I reached the ‘open’ museum I couldn’t enter and there didn’t seem to be any information on how to enter or what to do. 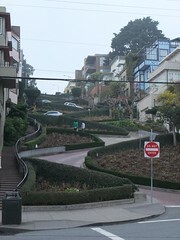 Lombard Street – It’s a twisty, twisty street. That’s about it. Still one of those things traditional tourist spots. 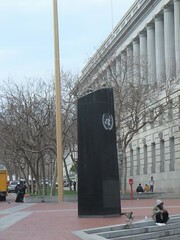 UN Plaza/Civic Center – San Francisco was where the UN Charter was signed so I couldn’t help but take a few moments at the UN Plaza. Although only a few moments, it felt a little seedy. Ferry building – I came through on the weekend when it housed a farmers market on top of its regular shops. There were plenty of tourists and locals around calmly queuing for the various goodies on offer. 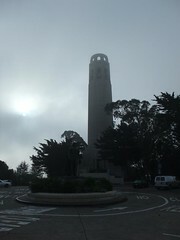 Coit Tower – This impressive tower stands atop a bluff looking out over the Bay. 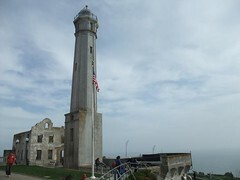 When I walked up I was too early, on a clear day it would be worthwhile to pay and take in the views from the top. Mama’s – A brilliant breakfast at Washington Square. 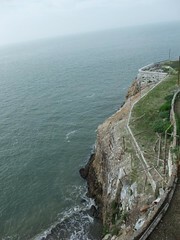 It’s popular with tourists and locals. The staff are busy but will try and help as much as possible. Cafe Trieste – On a side street near a church this crowded cafe offers the usual assortment of coffees and snacks. Apparently it’s quite popular. The mocha was reasonable and sitting outside offered some decent people watching. Blue Bottle – This was a late recommendation but it was a good call – thanks LaydeeNerd. The Blue Bottle was located at the Ferry Building and there was quite a queue on the weekend. 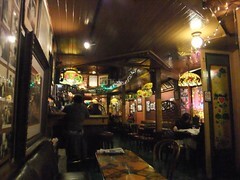 While the mocha wasn’t as sweet as I’d like it was still nice and other patrons seemed happy with their brews. Peet’s Coffee – A local coffee shop chain and it was excellent. The staff were friendly and the coffees tasty. I wish it was warmer so I could have tried their chillers as well. Oh well yet another reason to come back. On the whole I liked the city but I don’t think I could live here. It’s not just because of all the hills but the city just seemed too quiet for me. There was a considerable lack of bustle. I’ve grown used to a certain level of activity after living in Sydney and London. Perhaps I could learn to thrive on less – but not yet. Certainly for a holiday spot it’s great and well worth multiple visits. Often it seemed as though each corner brought out a new type of district, each with its own flavour. Hopefully next time I’ll go beyond the city core as well! More photos at Flickr and locations at Google Maps.